In his lyric post Miguel,Miguel, Miguel - homage to Miguel Enríquez - the Chilean poet Fesal Chain illustrated with this picture, without text, of Miguel Enríquez and I (photo here below). I wrote a comment to Fesal, which he made it public in his recent post Una bella y maravillosa carta de Marcello Ferrada Noli. Here I publish the comment I sent to Fesal. The text in English ensues down below. Miguel Enríquez is a hero of the armed Resistance against the fascist Coup D'Etat of 1973 in Chile. He died heroically in October 1975 after resisting alone with his AK47, and wounded, a several hours assault of the military forces, thus allowing his comrades to escape the siege. Miguel was a founder of the MIR, and its head commander. Fesal, lúcido significante bello tu poema de Miguel. Nostálgico como todo lo que escribes. Como aporte, la foto que publicas encabezando tu homenaje es de 1967. El MIR tenía sólo dos años. En las foto estamos Miguel y yo en la Desembocadura del Bío-Bío. La foto la tomó Inés Enríquez, la hermana de Miguel, con la cámara Yashica que Miguel había recientemente comprado durante su viaje a Asia. Esa es la cartuchera que pende Miguel en la foto. 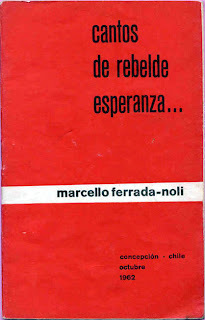 Cinco años antes de aquella foto había yo publicado “Cantos de Rebelde Esperanza” (Imprenta Orellana, Concepción, 1962), libro que dediqué a mi amigo Miguel Enríquez. Y aquí quiero llegar a mi punto en este comentario. Una crítica legítima y oportuna sobre el qué hacer del poeta, que se atisba en Puebla. La que yo asumo con retrospectividad. y llorar a los que esperan”. Que la lucha no termina”. Por mi parte. Yo dejé el oficio público de la lírica y tome otros. Otros pinceles con los mismos colores, se podría decir. Por tu parte. Afortunadamente tú y muchos en tu círculo literario son un despertador de calidad, concreta y cotidiana. Son en el espíritu de Puebla, de ”la lotta continua”. Son necesarios. Porque no es hora, nunca lo fue, de llantos ”ni lágrimas ni quebrantos”. Y los puros de corazón van al sacrificio. Fesal, your poem on Miguel is lucid, significant, and beautiful. Nostalgic as everything you write. Fairly, from the perspective of what the role of a poet shod be - and from the perspective of Miguel himself, I would say – you inserted the memory of a passage from Carlos Puebla’s ”Miguel Enriquez is called”, the Puebla homage to Miguel Enríquez in 1976. To contribute, the picture that you post in your poem to Miguel is from 1967. The MIR was then only two years old. In the photo we are Miguel and I in the estuary of the Bio-Bio. The photo was taken by Inés Enríquez, Miguel's sister, with the Yashica camera that Miguel had recently bought during his trip to Asia. This is the holster that hangs Miguel in the picture. Five years before that photo I had published "Songs of Hope Rebel" (Cantos de Rebelde Esperanza, Imprenta Orellana, Concepción, 1962), a book dedicated to my friend Miguel Enriquez. And here I get to my point in this commentary. It is about a legitimate criticism on the “what to do” of the poet, which is glimpsed in other of Puebla’s lines at his composition ”Miguel Enriquez is called” that you quote. I assume that criticism with own retrospectively insight. and mourn those who wait." That the struggle is not over. " For my part. I left the publicly endeavour of writing poetry, and took instead others. Other brushes with the same colours, you might say. For your part. Fortunately, you and many in your literary circle produce a everyday wake-up literature, concrete and with quality. Whis is in the spirit of Puebla, of the "Lotta Continua". Those are necessary. Because there is no time, it has never been, time of weeping tears. And the pure in heart go to the sacrifice.